Monday: Self-made core circuit from last week. We changed up one of the planks but otherwise kept it the same. Tuesday: "Recovery" speed work...meaning the pace wasn't as fast as we usually try to keep it lately. We did 6x800 repeats and kept the paces in the low- and mid-8s. Between each repeat I alternated tricep dips and push-ups (15 reps) because I forgot my weights. 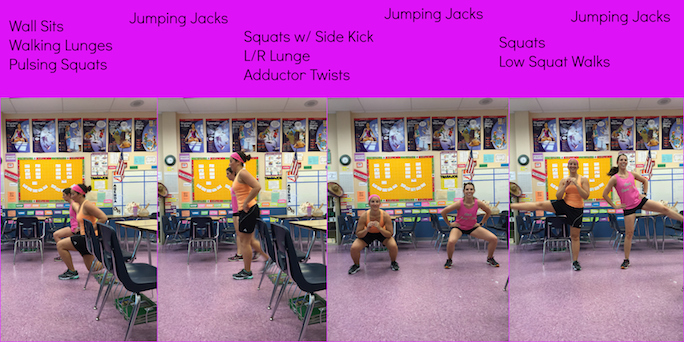 Wednesday: Elizabeth and I completed the leg circuit I created a couple weeks ago. As usual, I was dripping and shaking by the end! This one is definitely a keeper. Thursday: Rest...and well-deserved. Standing up after sitting and climbing chairs made my quads ache! Friday: This five mile run started off shaky. My legs still felt pretty stiff and heavy from Wednesday's leg day, and I realize now that on weeks when I do an intensive leg day I may need to keep an easier pace on my Friday run. But I warmed up as I went on, and this turned into a pretty consistent progression-style run! 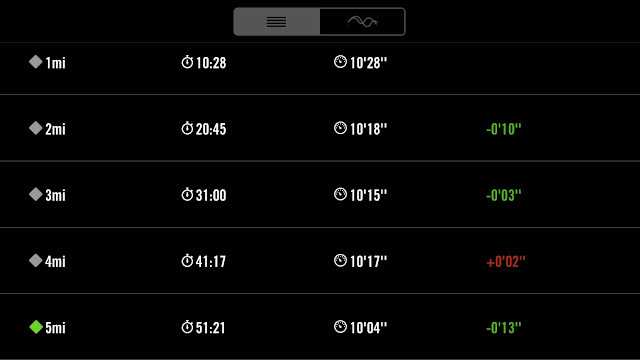 I felt like I was working moderately hard the entire run, but the last two miles felt the easiest. Sunday: Nine very sunny, hot, and humid miles with Elizabeth at a 10:42 pace (we had positive splits because by the time the sun was fully up, it was so hot and we were dying). This run was not fun, but we got it done. I had to walk a little at mile 7.5 or so. It's really time that I resigned myself to starting long runs at 5:30; starting after 6 just isn't cutting it. I was in new shoes for this run. I got the Asics Kayano 22s after being in the 21s for the last couple years. The new design is much narrower and the toe-box especially is more snug. I'm not sure if I like it. I tried going up a half size and the shoe was obviously too big, but the smaller size is pretty tight. I didn't get any blisters or painful toenails, but my feet didn't feel as comfortable as I'm used to on long runs. I'm torn - they're okay, but I'm just paranoid about the tight fit and I just don't love them. They're SO pretty...I want them to work! I may need to branch out and try other shoes, which is really disappointing being the Kayano has been my sole-mate for years, and we all know how stressful finding new shoes can be. I wrote a constructively-critical letter to Asics, and I'm naively hoping that they fix the toe-box issue in the 23s. Did you have a productive week? Great job on staying consistent with your workouts. I'm jumping back on the wagon after being sick the last two weeks. If you don't love the sneakers, don't keep them...you and your feet need to love them!!! I think I need to try that leg circuit! I love a good, challenging workout like that! And yeah, I'll soon need to start getting up early on weekends to beat the heat. Boo! That's my shoe. I didn't love it as much as the others either. I don't know why. I never felt tight in them . There was just something. The 21's are great! I had those for a long time. I now use Brooks Launch. They have plenty of toe room and still the same cushion as the 21. Great week! !